Looking for our FREE Downloadable Content? Please be aware that you do not have to register just to listen! To play any episode navigate to our Home page and simply click on any of the player icons below the photo of the speaker you are interested in. If you are interested in our FREE supporting articles and charts the usual way to get links to these downloads is via our FREE weekly Research Roundup e-mail. Registered users are automatically added to our Research Roundup distribution list so register now for FUTURE episodes and you’ll begin receiving Research Roundup automatically. 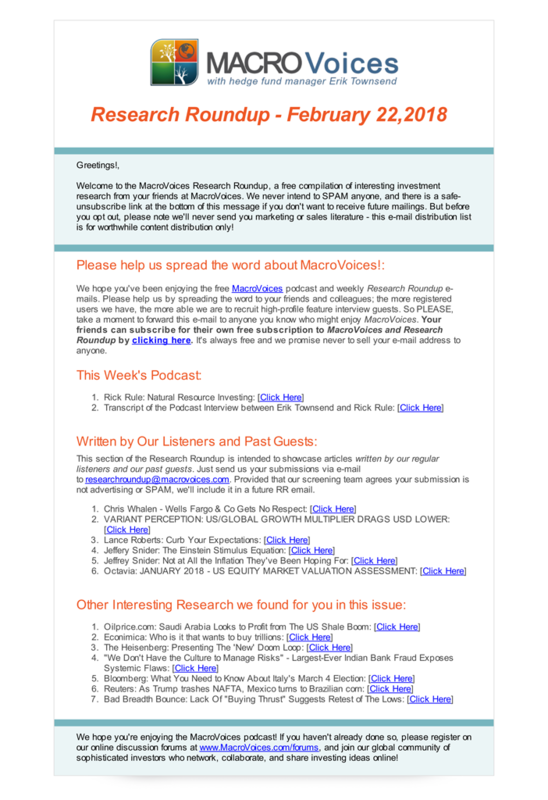 If you’re looking for a download in support of this week's, or a prior, episode and you don't have the associated Research Roundup issue, login if you are already a registered user and then navigate to the Research Library area where you’ll find the downloads in the Guest Publications section. If you are not already a registered user you can register here. And remember, the materials we provide are always free of advertising or marketing. Looking for Past Issues of Research Roundup? We are pleased to now offer downloads of past issues of Research Roundup. Click on the image below to access past issues. Note: At this time we are only offering past issues for 2018. We may add earlier years in the future.